Great news – you’ve got five days off and you’re planning a trip to the mid-North Island. If you’re not sure where to go or you’re looking for some tips on hidden gems along the way, then you’ve come to the right place. This five day itinerary takes you to some of the best tourist destinations in New Zealand, however it also takes you to some of the lesser known places in between where you will get the chance to explore rural New Zealand. Anyway, enough of that – it’s time to find out more about this kiwi adventure – let’s GO! There are a couple of ways to get down to Rotorua so the good news for you is that you don’t have to drive the same way twice. It also means we’ve got twice the number of things to see and do on your way down and back. We have decided to head off the most direct route on the way there so you get as much time as possible in Rotorua to explore. After leaving the suburban sprawl of Auckland behind you, you will soon hit the open road as you leave SH1 and head down SH27 towards your first stop of the day and one that we’re pretty excited about. One of our main reasons for coming this way first is to stop off in one of our favourite locations in the North Island. Many people have never heard of Matamata (even though it’s so good they named it twice!) 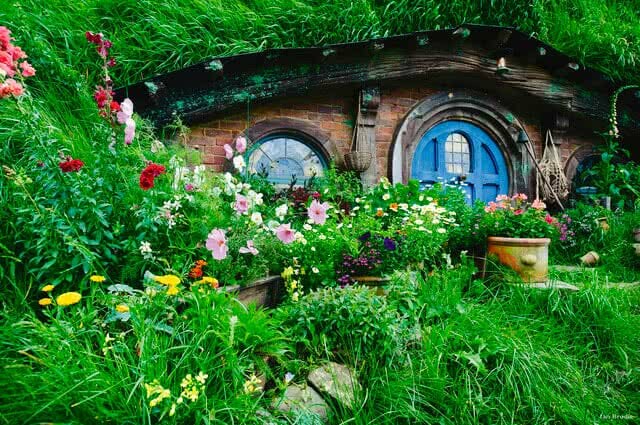 but speak the words ‘Lord of the Rings’ or ‘The Hobbit’ and you soon see that spark of intrigue that only comes from the opportunity to visit one of the most famous movie sets in the world. That’s right people, the first major stop off on this adventure takes us to Hobbiton and the home of The Shire made famous in the Lord of the Rings and Hobbit trilogies. Take a guided tour of The Shire and you’ll soon see from the rolling hills why Director Peter Jackson chose this location. Wander through the 44 unique hobbit holes including Bag End before stopping off for a pint in the Green Dragon Inn. This is a must for all Lord of the Rings fans and even if you’re not, it’s well worth a visit as it’s a truly captivating place. 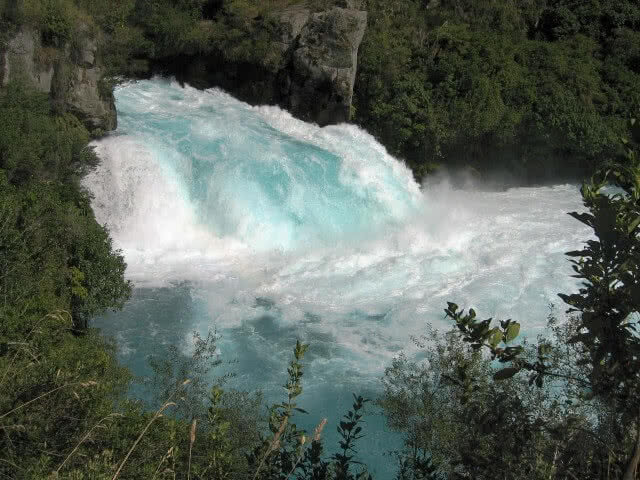 If you’ve got the time, a trip to the Wairere Falls is also worth a shout. At 153m, these are the highest waterfalls in the North Island and there is a great walking track that will take you up to a lookout where you can enjoy some pretty awesome views over the Waikato as well as a bird’s eye view of the falls. From here it’s only another 68 kms to Rotorua which should take you just under an hour leaving you plenty of time to explore this afternoon. After the drive down and checking into your accommodation, it’s a good idea to give your legs a stretch so head out and take in the sights, sounds and smells of Rotorua. There’s no getting away from it – this place has a certain aroma to it that some find a little overpowering – we find that you soon get used to it but none the less, be prepared for the sulphuric smell to hit your nostrils as soon as you step out of your car. Although we like to recommend some of the more off-the-beaten-track activities in our itineraries, there are some things that you just can’t miss and the Rotorua Museum is one of them. Located in the iconic Bath House building, this is a great opportunity to take a step back in time and learn about the region’s rich Maori culture and volcanic landscape which have shaped the town you find before you today. One of the best places to see the geothermal wonderland it in all its glory is Wai-O-Tapu, a place that encompasses a range of different volcanic activity, including the world famous Champagne Pool and the Lady Knox Geyser. You’ll want to spend a good couple of hours wandering around Wai-O-Tapu and visiting all the different lakes, mud pools and geysers. And…Wai-O-Tapu is a GO Play partner so you get all this geothermal fun with a 10% discount. Result. Rotorua is a bit of a mountain biking mecca in New Zealand with over 90kms of world-class mountain biking trails. Most weekends you’ll find races taking place in and around Rotorua and the trails are popular with amateurs and professionals alike. Perhaps one of the best experiences can be found at the Skyline Gravity Park located on top of Mt Ngongotaha which overlooks the city of Rotorua. Take the gondola to the top of the peak and experience over 8.5 kms of downhill track. 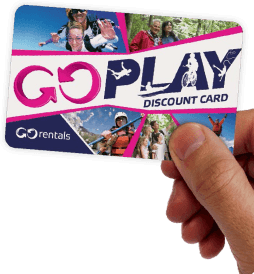 Half and full day gondola passes are available and for us, this is cycling at its best – all the downs and no uphills! If you want the ultimate in relaxation we suggest you take a few hours to visit the Polynesian Spa, voted one of the best spas in the world. Choose from a range of hot pools or book a massage and enjoy a couple of hours of what holidays really are about – doing absolutely nothing. Rotorua really is the town that keeps on giving with lots more GO Play partners based in and around this geothermal wonderland. Hopefully you managed to fit in everything you wanted to do yesterday but you still have some time this morning if there is anything you missed. We have only given you a flavour of the things you can do here but you may decide you fancy something a bit different so go knock yourselves out and have some fun! Taupo is a great place to spend a couple of days no matter what you are in to. Whether it’s a relaxing weekend on the shores of the lake that carries the same name or something more adrenaline fuelled like chucking yourself out of a plane, Taupo has it all. Lake Taupo was actually created nearly 2000 years ago by a volcanic eruption which, according to Maori folklore ‘darkened the skies in Europe and China’ – pretty explosive stuff!! What we’re left with is New Zealand’s largest lake where you will find some of the best fishing in the country as well as some geothermal activity at the Craters of the Moon. Only accessible by water are the magnificent Maori rock carvings at Mine Bay. Take a boat trip or if you’re feeling energetic, hire a kayak around the secluded bays and beaches that border Lake Taupo where you will find this fascinating carvings. Lake Taupo has an abundance of rainbow and brown trout so if a day relaxing, sitting back and casting your line sounds like your idea of heaven, then you’ve come to the right place. If you want something a bit different, you can always have a go at fly fishing in the Tongariro River. The Great Lake Trail is one of the 23 great rides of New Zealand and a must for cycling enthusiasts. Covering a total distance of 71kms, this one is not for the feint hearted and it’s recommended that you take 2-3 days to enjoy the cycle properly. That’s not to stop you heading out onto the track for a few hours though to catch some magnificent views of the lake and Tongariro National Park. Although many people choose to stay up in the National Park, it is possible to head off and do the Tongariro Alpine Crossing from Taupo and there are bus companies that will shuttle you up to the start of the walk but be prepared for an early start. The walk itself is often referred to as the best one day walk in New Zealand and is a highlight for many travellers to these shores. The weather can change quickly out on the walk so make sure you pack for all seasons from the sunscreen to the warm base layers – even if it’s a lovely sunny day when you set out, things can soon change out on the track. By the end of the walk, you’ll probably feel like Frodo and Sam so treat yourself to a big feed and a cold beer at the end of a great day when you get back to Taupo. So after a busy couple of days in and around Taupo and Rotorua, it’s time to start making your way back north towards Auckland. With a relatively short drive ahead of you today up to the Waitomo Caves, you will definitely have time to squeeze in any activities you may have missed yesterday in and around Taupo so fill your boots. Another one for cycling enthusiasts and another one of the 23 great rides under Nga Haerenga, The New Zealand Cycle Trail, the Pureora Timber Trail will take you through some spectacular forest terrain, over suspension bridges and through ecological areas showcasing the remnants of the forest that once dominated the area. At 77kms, this is another 2 day cycle but there are lots of shorter trails you can take from the starting point at Pureora Village located off SH30. If cycling is not your thing, there are also loads of walks to do in and around the forest so take your time and enjoy the day. Arriving later in the afternoon is perfect for this particular activity. The Waitomo Caves have been formed by rivers and streams pushing through the soft limestone over thousands of years and are now home to some amazing sights and sounds. From the stalactites and stalagmites that grow from the floor and ceiling to the incredible glow worms that light up these underground grottos, this is a stop over not to be missed. If you’re looking for something a bit more adventurous, you can always experience some blackwater rafting inside the caves where you‘ll be transported through the caves in a rubber ring. Sounds pretty cool to us. So, the last day of your trip has arrived and the trip back to Auckland which will take you just over 2 hours. We do have a few little stop offs on the way today depending on what time you have to get the car back to Auckland to help break up the journey. Known as the rose capital of New Zealand, November to April is a great time to visit Te Awamutu to smell the beautiful flowers in full bloom. During season, you can take in the magnificent sight of over 2000 rose bushes in full bloom next to the visitors centre. Nestled on the banks of the Waikato River, Hamilton is a great stop off on the way back to Auckland to grab a bite to eat after all the adventure of your morning trip up from Taupo. With some great riverside walks, the stunning Hamilton Gardens and a wealth of places to eat, it’s a great way to break up the journey before the final leg back up to Auckland. As you head north and Auckland draws ever closer, we have one last stop off for you before you hit the city but we think it’s one you’re going to enjoy! The Pokeno ice cream store is renowned for the biggest ice creams in the country. Pokeno Takeaways, on Great South Road, will sell you a 15-scoop ice cream (yes, you read that right). Treat yourself. See, we told you it was worth it! From here it’s just over 52 kms to Auckland which depending on traffic should take you anywhere from 35 mins to an hour to allow plenty of time. If your 5 day trip allows you some time to explore Auckland, make sure you check out our Top 5 things to do in Auckland. So that brings this five day adventure to an end – we hope you have enjoyed it and found some of our tips handy – if you have come across any hidden gems on your travels, make sure you share them with us on our GO Explore Facebook page and help out your fellow travellers!